The Atlas Air has received a complete redesign. It is impossibly light, flexible, and showcases a sleek, simplistic and sophisticated new design that is the perfect combination of fashion and function. New features include an insanely low weight of 599g (1.3lbs), redesigned body hugging frame shape to reduce brace movement and improve fit/range of motion, simplified Easy Open release system, stronger and stiffer long travel front suspension, back supports that appear smaller but increase surface area, all new reversible Smart Mounts with multi-angle adjustment, lighter and tougher padding material in vibrant new colors, and a redesigned innovative tether that eliminates the need for multiple tools. The overall height of the Atlas Air Neck Brace has been reduced, yet the amount of surface area in contact with the body has been increased, in order to maximize the distribution of impact forces. In fact, each Atlas Brace sits on 27% more of the body than the competition. A smaller and lighter product feels like you are wearing less, greatly enhancing the user experience of a neck brace. The most amazing thing about wearing it is that you forget you’re even wearing it. Smart Mounts – One mount, 6 positions. Reversible to adjust size, and choose from a -10", 0", or +10" back support angle in either position. Height Adjustment – Choose from 2 possible height adjustments to create the best fit for your body type and helmet choice. Feather Weight – New weight is 20% lower than the previous model. The most amazing thing about wearing it is that you forget you’re wearing it. Surface Area – By sitting on 27% more of the body than other neck braces, comfort is maximized, and forces are distributed more efficiently over the body. Absolutely love this neck brace it is super light and comfortable to wear. Great fit. Doesn’t get in the way. Never was sure how well it worked til I took a hard tumble on a day I forgot to put it on. Had a sore next for a few days after. The best neck brace brand out there. I heard that this was the best brand, so I gave it a try. The Atlas neck brace provides comfort and is very light weighted. it is very light and barely noticeable. it sits so low on your body and gives a range of motion that is like nothing is being worn. i love it and can feel that it stops hyper extension in my neck even with the huge range of motion, without it feeling intrusive. i love it and reccommend it toanyone wanting a neck brace. Perfect! Have plates n artificial disc in neck and I'm 50yrs old.. this is a great product! I paid full retail and have no reservations ..it's as good as leatt , it would come down to fitment on your chest protector and personal preference and which one you can get for the best price. Have a LEATT brace, in my opinion this is not as custom of a fit, but it is much lighter. The way it flexes in the back is much more comfortable than the LEATT. I would rock either one though! This seems like a good product so far. I've ridden it at the track a few times now. I don't notice it being there. Easy to take on and off. Works with my older Fox chest protector. Spend the money save your neck! Wasn't sure what to expect having never used a neck brace before. First time wearing it I really didn't notice it, still had all the range of motion on the track as without one. NOTE If you want to save some money buy the closeout model, if the colors are crap just peel the stickers off they're all black underneath only the pads are whatever color pictured. Awesome neckbrace, it's my first neck brace so I cannot really compare it to others. I hardly notice it's on while I'm riding. Just picked up the atlas defender to go with it. When I received the neck brace my decals were all ready peeling off, called atlas and they sent me out new decals no questions asked. Top notch customer service. Atlas and RMATV/MC have my business for ever! Will never ride without one. Anyone who says its uncomfortable is super sensitive. I don't use the straps and this falls out of place too far forward while riding. It doesn't bother me that much and i adjust it while riding. No different than reaching for a tear off. Don't even know thats its there! Fits great and totally forget that I'm wearing it. Very comfortable. Great fit and ease of use. Only complaint is that the supplied chest harness is tricky to connect to the small brace clips. I was hesitant on using a neck brace but after a hard crash on the track I decided it's time. Tried on a few in stores and liked the Atlas the best. It doesn't seem to restrict my range of motion at all and I forget I'm even wearing it. Works great on the track or on the trails. As far as how well it works, I have been lucky enough to not find out! It stays in place well with and without my roost protector so I trust it will do the job when the time comes. Very lightweight brace. The split flex frame lets the brace move with you when going down the trail/track, rendering in barely noticeable. Fit is close to true, if not slightly large. When I was adding the included pads to customize the fit, one of the Velcro strips separated, so I had to gorrila glue it back on! Otherwise, durability has been good. Safety is my number one priority as far as my son is concern! This product does just that, it protects his new, now he feels safe, knowing he has a good neck brace on!! Recommend this product absolutely!!! Thank you RM?? This is a great product that is worth the investment to help prevent serious injury. Very comfortable and lightweight, fits ok with my old ARC roost guard until can get a newer one. Lots of good color options. RM is so good to work with! Best Brace on the Market!! This neck brace is the best one money can buy! It is extremely light and comfortable! Provides top notch protection! This fits great with my Fox titan armor. Also fits with me wearing a camelbak and fanny pack for enduro gear. Does not limit my head movement in most cases. Sometimes in really fast sections the back of my head will hit the brace but then I just use my eyes to look further ahead. Thought I would hate it but don't even know it is there. Comfortable on the first ride and like I said works with my current armor. Only thing that prevent it from being 5 stars is the elastic harness that holds it down sometimes rides up. This is the first neck brace I've used. I always felt that neck braces prevent you from looking up, which I feel puts you in a bad riding position. The atlas brace stays out of the way, promoting a good riding position while offering good protection. I am in between sizes at a 41 1/2" chest. Any recommendations on sizing? BEST ANSWER: I think they only go to large ,not XL .I'm 6'1 205 with @ 40 chest.My Atlas fits like air, as in you dont know you have it on. My son wears a Leatt ant I convinced him to try mine for a few laps..His conclusion was "i don't feel like its got enough protection" ..I disagree. Its not restrictive. I'd go with the bigger size. Unless you plan on losing some weight in the near future. I'm 42 1/2" and got a large. Fits great. You can adjust the flaps on the back as well as the straps. I would go with a large. Does this neck brace fit the front and back slots on a leatt 5.5 HD chest protector?? BEST ANSWER: it tucks into the front slots, and the rear supports would tuck under the protector. How well does this brace work with an Atlas Air neck brace? 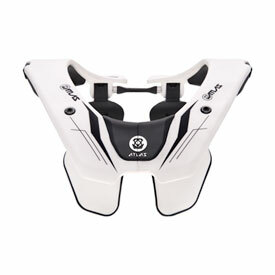 BEST ANSWER: We use the fly racing level CE roost guard chest protector with our Leatt neck brace. We don’t have the Atlas air neck. I can say it works fantastically with the Leatt. Very comfortable chest protector. Doesn’t dig in the top of your legs when riding. It’s taking quite a beating, still looks great, all clips still working, and the inside lining is holding up very well. Not sure Ryan, but it works great with a leatt! Quality, great piece of gear! Question is this...I had a motor vehicle accident last year. To use the side by side or skidoo is hard to do because my neck doesn't support the weight of the helmet on my head/neck. Will any of these braces help with this and to stop the neck from bobbling around or are these meant purely for dirt biking and preventative measures for accidents ? Thanks so much. BEST ANSWER: In my opinion these neck braces help limit the amount that the head is able to move thus helping to prevent neck injuries. Yes they limit mobility to an extent but there has to be a trade off between mobility and amount that the neck can move causing injury. I feel the Atlas gives the most mobility while providing protection. So yes they help some from making you a bobblehead but not completely. When strapped into a side by side the body is held but the head is not. I understand the problem. Maybe try someones neck brace before buying. Or see if something is available from say a medical store that will help limit movement. Hi, sorry to hear about your accident. I don't think the brace would help by itself as it is designed to give you movement in all directions, but limited to prevent major injury. While wearing mine I can turn my head left and right, and move my head side to side almost all the way.... back and forth movement ( up and down ) are limited as the helmet makes contact with the neck brace. I think its designed to not interfere with helmets as much as possible. Hope that helps. I don't think this would be the best option for you. In normal use, the helmet doesn't contact the brace, it just limits the total range of movement so that your head can't go too far forward, backward or side to side. There are some foam braces that might work better. But honestly, you should work with a good physiotherapist to regain neck strength. I do some exercises and my neck is significantly stronger for it. This are not designed to support the weight of your helmet. They are designed to limit how far your helmet can move, and to some extent redirect the forces that would strain your neck. They don't stop your head from bobbing around, although it will limit how much it can move. They are not just for dirt biking, but they are a preventative measure against neck/spinal injuries. This neck brace is not snug fitting to the body or neck, and doesn't actually touch the base of the helmet. It allows for some side to side and forward/backward movement of the head and neck. This is not a neck support, it would not protect you from motion of skidoo. It only protects against hyperextension front to back and side to side. It does help limit head an neck movement some but it doesn't restrict your head Frome being able to move completely . With mine I still have about an inch of side to side ability to move an about the same rearward movement but forward movement is somewhat more . Not sure if this information helps to fully answer your question or not .. In short, the brace limits the amount of movement allowed, but it still allows a lot of movement. For me, this makes the brace comfortable and it allows the freedom to move your head to look around. If you can't support the weight of a helmet, you would still have head bobbling - not as much as without, but it would still be an issue. This Brace feels like wearing no brace and is just there in case of a crash to prevent damage. I would look into the early model neck braces, I remember riders complaining about not being able to move head freely or google what the race car drivers wear some kind of neck donut seems to prevent head movement. The brace will not help with the helmet bobbling around on your head. It does not contact the helmet while riding unless you tilt your head to the side or front to back. In short, it is a preventative measure, not an "active support". So I have an old leatt neck brace that saved my life once. And as I'm looking at these new neck braces. I notice how low profile they are. Does that effect the safety of the rider as with a low profile it allows the helmet to rotate more before its stopped. Or am I thinking of wrong way these protect you? I had a massive crash a few months back and i was wearing this brace. I endoed off a 75ft triple and landed on my head. This brace saved my life! I highly recommend these braces to everyone who wants to wear one! They are worth the money. Zac, no reduction in safety, in fact with the increase visibility due to the brace being a lower profile, it aids in preventing injury with the increased viability. Also, makes for a more comfortable product. My grandson has used atlas for about two years now with a bell moto flex carbon helmet, it sets real well on him. Order one and try it with your helmet, rocky mountain will gladly take it back. I am 6' tall and have a 47inch chest. I notice the large says its for 42 plus, but is that "plus" good all the way out to 47'? yes, the large will fit. Will this work with an Atlas neck brace? BEST ANSWER: I use a Leatt neck brace, but the front and back pads have cut outs to accommodate a neck brace. The front and back pad shapes look like they would fit most neck braces. The body mesh is super open and breathable and the pads all have smart venting. I like mine without complaint. Very easy to remove the pads and wash the top. Hi Justin, I am not familiar with the fitment of the Atlas brace, however all Leatt neck braces will work. I believe it will. The Atlas brace would fit completely over the protective garment shown. can I wear it over my Fox Proframe which is under my jersey or can i just wear it with no chest protector or Atlas Defender over jersey ? BEST ANSWER: Well, I use a fox protector also. What I do is put the atlas on first then I have my fox protector adjusted so I can slide it o we the atlas. Have to wear a little bigger jersey! But it works. No issue running with or without the Defender. You have have to adjust the back supports to increase the brace size, when running the Fox Proframe. do you think this brace will fit with the leatt adventure body vest roost guard? BEST ANSWER: I can't tell you as most riders that use leatt chest protectors or body vest use leatt neck brace from my experience but I can tell you that everyone I have talked with who uses the Atlas neck brace including myself love it. Fits most applications very well. I have not heard a negative thing about the Atlas neck brace. Honestly, we are not sure, as this is a older vest. We don't think it will work, without reducing comfort. BEST ANSWER: I have an atlas air neck brace and I wear it with a fox chest/roost deflector. The atlas brace sits high enough to clear most roost deflector shoulder areas. It can be a tight squeeze getting the protector over the brace it But it can be done with a little pressure. Once on it is fine for me. Hope that helped. I’m 5,2 what size should I get? BEST ANSWER: Brace sizing is dependent on the circumference of your chest. Based on you size, my guess is a small. You really should go to our sizing chart on our site at atlas brace.com, for accurate sizing. Will this work with the Alpinestars sequence roost reflector? BEST ANSWER: The rear top red section is easily removable (velcro) plenty room to allow rear support/s of a neck brace to sit in. Front i do not see a problem. I do not have a neck brace, but my guess is that it appears that it should work no issues. Again, I do not own a neck brace, but it looks like it should fit. This deflector is very easy to put on no strap buckles to adjust. When im done riding i hose it off lightly low pressure and hang it to dry. REMEMBER THE RED STRAPS IN FRONT ARE SEWED IN DO NOT ATTEMPT TO PULL THEM OFF ALL THE WAY THE 1ST TIME YOU GET IT, PULL FROM OUTSIDE ONLY. BEST ANSWER: The Air brace will work with the Bionic Jacket, but must tuck underneath the jacket. what are the dimensions on the neck hole of a large? BEST ANSWER: 7.5" ear to ear, and 9" front to back. will it fit with the alpinestars a4 chest protector? BEST ANSWER: yes, the brace is designed to tuck the front and rear supports under the protection. Can I wear the chest protector under my jersey and the brace over my jersey? when is the fire prism 2018 Atlas air brace going to be up for sale? BEST ANSWER: Rocky Mountain should be getting inventory approx. 2/1/18.